Every now and then while looking through endless web pages I get seriously sidetracked, sometimes because I have followed a thread which wasn’t part of my original research and sometimes it was induced for other reasons. On this occasion I was seduced into a purchase by wickedly low prices and good service. My plan was to seek out some Fly drivers and some drive shaft springs for a couple of up and coming projects. After a couple of false starts I decided to return to the tried and tested ‘Cincyslots’ It is very rare for them to let me down. So with a third of the world for the parcel to cover, I was feeling financially flush in the Paypal department and thought I might as well maximise the freight charges and maybe pick a model if I can find one I was either looking for or liked the look of! And that my friends, is basically what happened!! Several days later there was a large parcel on the doorstep and a nice glass of shiraz waiting to be poured for the opening ceremony. 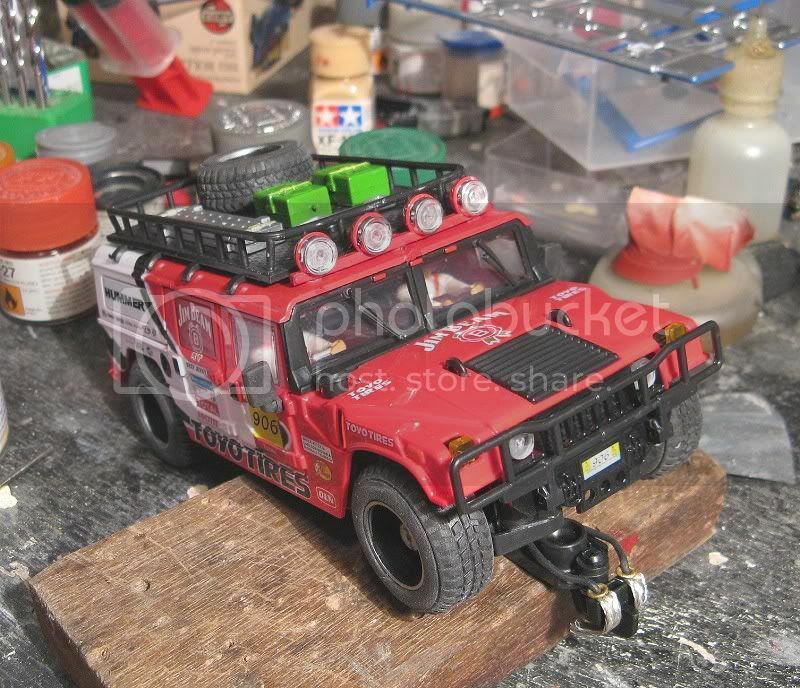 The local Brisbane group have raced raid models on one of the more trickier tracks and to date I have raced a scratchbuilt Colin McRae Nissan pickup truck which was a converted Revell ‘Easykit’ with some success (see scratchbuild forum). But there is nothing like the real thing. I toyed with picking up a discounted Ninco Bowler and some time ago I sold a BMW X5 which would have fitted the slot! So, even though it may never race in anger, I decided on a model which was impressive in name and stature. And that’s what I got. So my Fly drivers were accompanied by a Powerslot Hummer on their journey across the Pacific. The Hummer is here now and what have I got for my money? Well, 182 grams of slotcar for a start! Powerslot have built this like a brick outhouse and it will take some pretty rough treatment to do it harm. Having said that, it has some characteristics which could well see it self destruct. But more of that later. First things first and lets check how well its made. The paintwork and tampo don’t have a trick missing and from what I can tell, Powerslot have researched this model and faithfully reproduced all the sponsors endorsements on the vehicle. 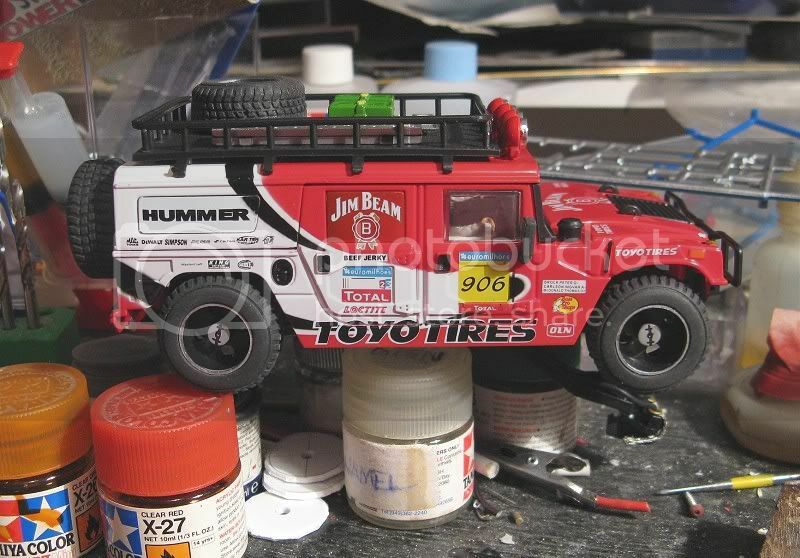 Toyo tyres and Jim Beam seen strange bedfellows but if nothing else they make up the majority of the decals. The rest are names known and unknown, including a Bass fishing pro shop? 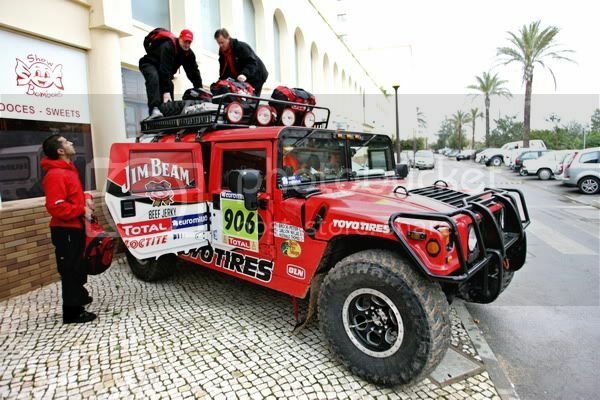 Not quite sure where that fits into the Dakar? This model is quite striking from a distance but up closer there are distinct overtones of slap-dashery. 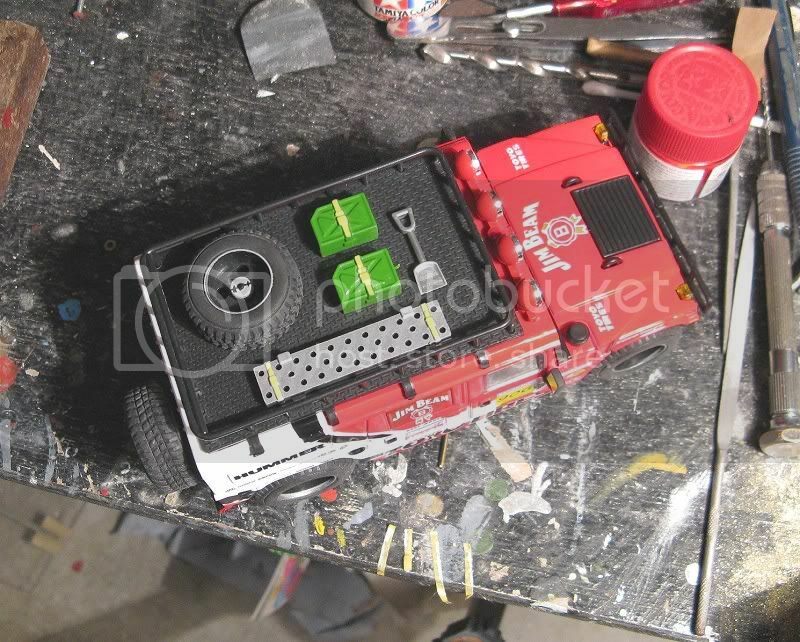 The colours are crisp but the tampo is fuzzy and in places blurred, very reminiscent of Teamslot models. Sharp line degenerate into messy overspray wherever there is a contour change. Colour is missing from door gaps and in other places the colour has run along the gaps! One big plus is the model has a lot of retro fitted parts like the driving lamps, roof rack, spare wheels, mirrors etc and these are fine as far as tampo is concerned, obviously being painted before fitting. 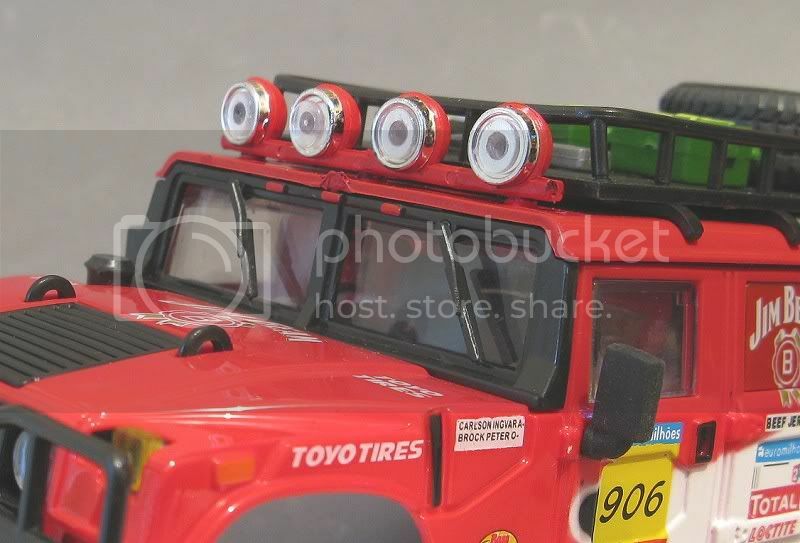 The driving lights on the roof look great and I can’t help thinking that this model should have had a complete compliment of working lights, if only to blaze down the track on a Red Team race night. No doubt someone, somewhere has taken the initiative and converted them already! The bull bar on the front looks and feels sturdy and once again it would be nice to think this will handle most knocks. Door mirrors are rubber with a stick on silvered piece and should outlive most other external parts. The roof rack looks strong too and it has its compliment of necessary off road accoutrements, shovel, jerrycans, sand tracks and the obligatory spare wheel, and there is another on the back door too! Looking closer, the wheels and tyres are something else. The wheels aren’t that well painted and are very plain but the tyres are some of the best slotcar knobblies I’ve seen so far! And apart from the six on the model…..there are another two taped under the display case base!! The tyres are very soft and there looks to be an air gap between the tyre carcass and the wheel rim, giving the tyre a softer more pliant feel. 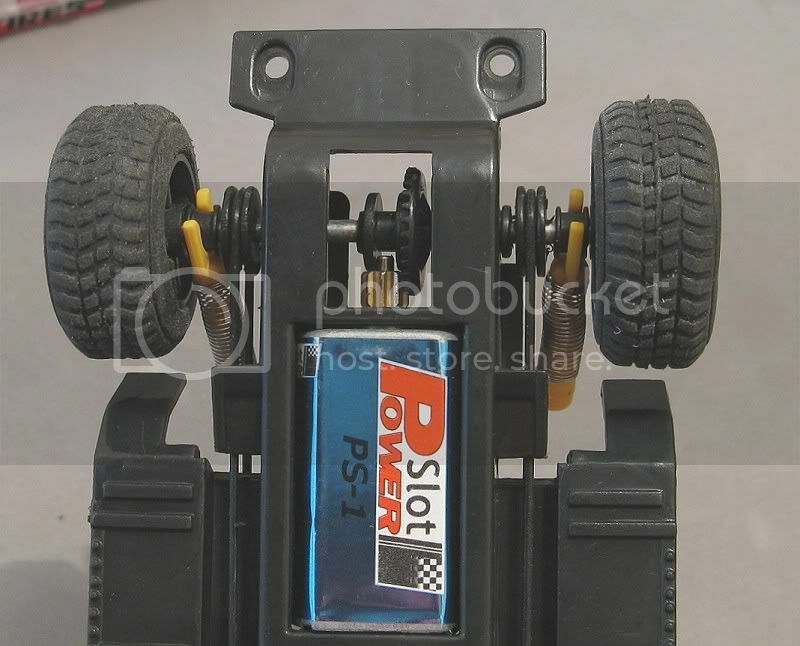 Powerslot have gone for the SCX effect with their driver and navigator. Both are very basic, reminiscent of Scalextric drivers from the seventies. Next up is the underneath. A very busy underneath too. 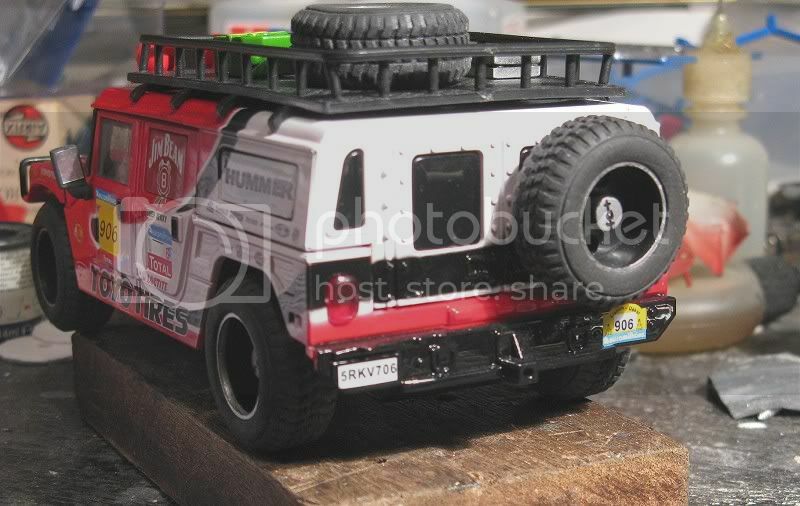 The motor is angled down probably to generate a bit more clearance under the centre of the model, indicating to me that this has been designed for some serious ’off slot-road’ action, more like the SCX models and unlike the Ninco raid models. There is a very effective spring loaded drop down guide arm with a spring loaded guide fitted to it. The guide didn’t seem to be as deep as I would have expected but there is a round neodymium magnet mounted in the guide arm directly behind the guide. This is all there is to keep it in the slot as there are no other traction magnets fitted anywhere on this model! 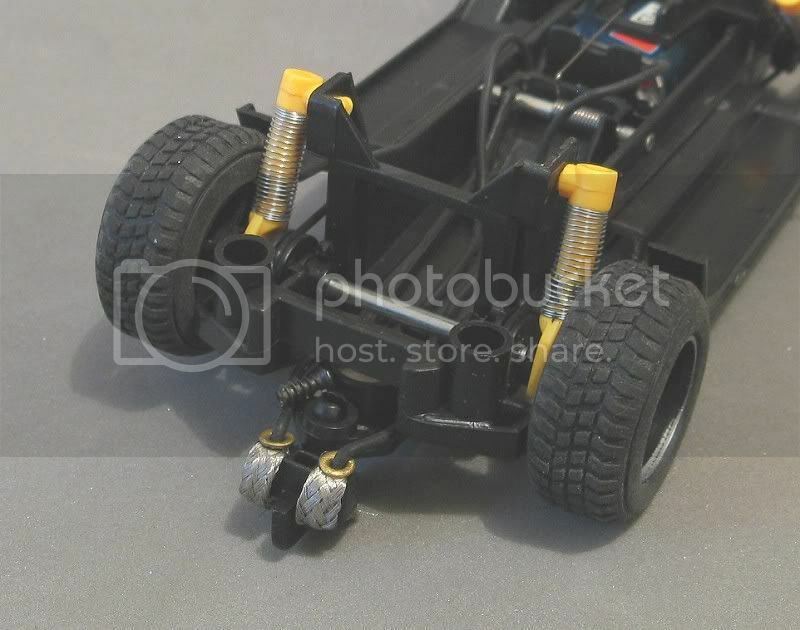 The front and rear axles have suspension but I wonder if it is that effective? Even though it has some fine spring assisted dampers the axle travel at the back is minimal at best and at the front one side seems to be jammed up?? This will need further attention but I can’t see the suspension being any more than a token gesture. 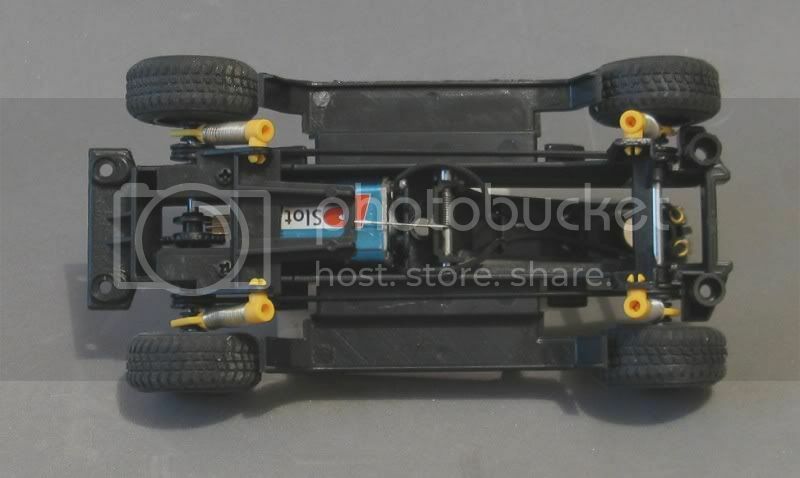 This model is also four wheel drive, but……. 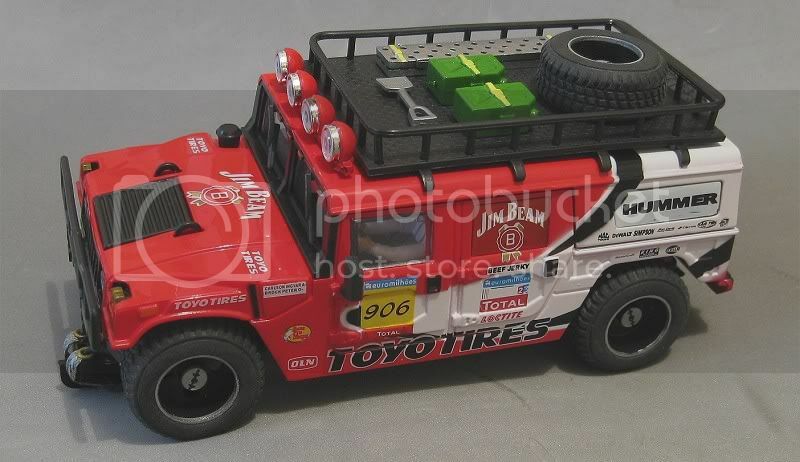 the front wheels are driven by two drive bands running in axle pulleys, similar to Ninco, which once again are a poor excuse for 4WD. The bands rub hard against the chassis along both the top and the bottom and when you turn the rear wheels the fronts barely move, demonstrating the amount of torque that can be delivered to the front axle!! Not a lot! Once the top is off things look very basic. Inside the body there is heaps of space and not a lot to occupy it. 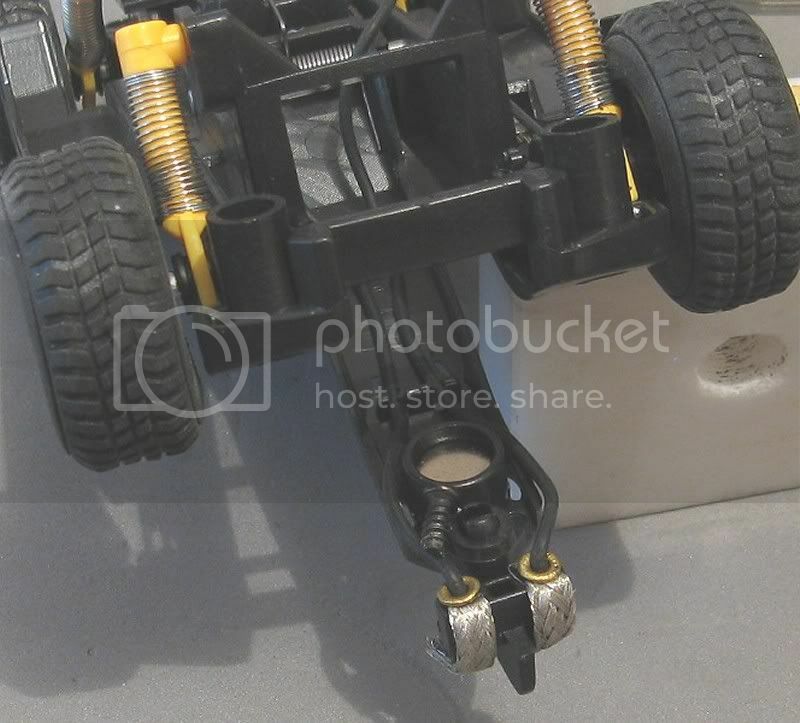 The chassis is very sturdy and the motor looks hard to access so I suppose it’s there for the duration. The guide arm is sturdy and well mounted allaying fears of costly or unrepairable breakages and the shock absorbers and their mount also look tough, even though they won’t be doing much. So that is very much it. I haven’t even gone to the length of measuring up the specs as it all seems a bit academic for this type of model. Suffice it to say that for this model, the Powerslot PS 1 motor has more than enough grunt. Enough in fact to enable it, with the help of the sprung guide, to do a wheel stand the length of the Red Teams’ main straight. Very impressive but watch out for the underpass!! So what have we ended up with? 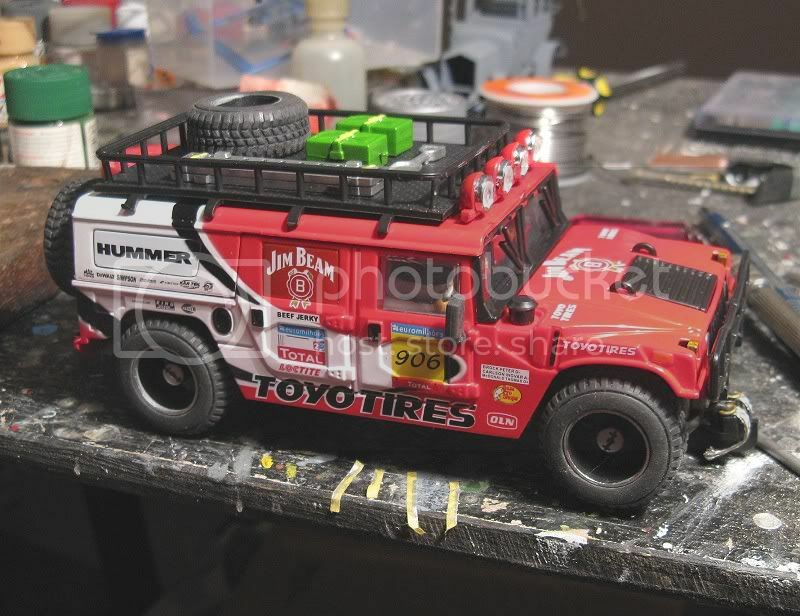 Quite a likeable and impressive slot model which will introduce a light hearted intermission to a night’s slotracing at worst, and a defiant, ‘get out of my way’ type slotcar for more serious off road / raid racing! There is plenty of grip in the tyres and there is a good turn of speed in the motor and I can just see it running the coarse of an SCX off road set, complete with humps and bumps, watersplashes and bridges. 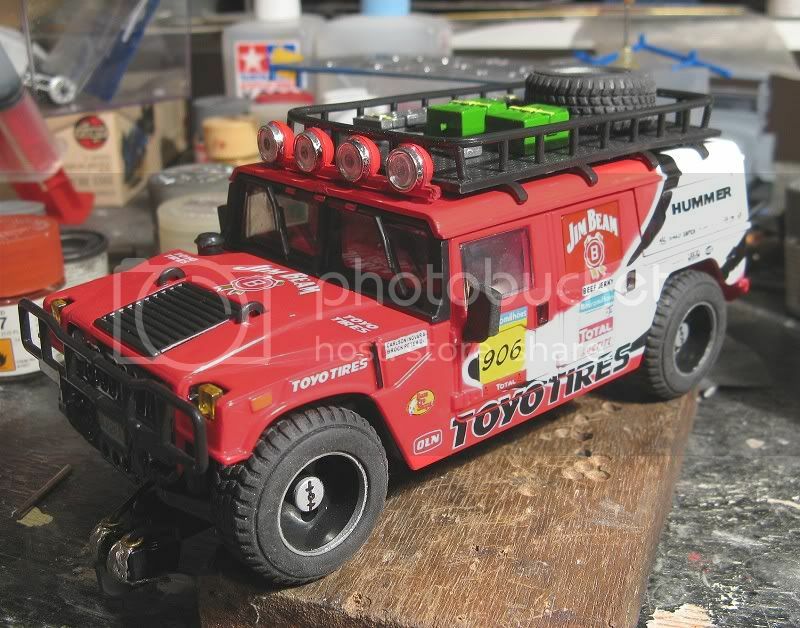 But what I am most looking forward to is seeing it muscle its way through the Ninco and SCX competition in a Slotcar Legends race day, especially at Jordan’s!!! (fades out with a sinister Vincent Price type laugh)……………….. I recently had an opportunity to take the Hummer for a competitive spin. One of the classes which raises its head from time to time is Raid. This is specifically for those larger than life models like the four wheel drive semi trucks such as the Touaregs, the Mitsubishis, The Schlessers et al. My choice was the Hummer. I had been nurturing it for some time and having given it some unaccompanied track time. Now was the time to put it to the test. Off to the race venue early and more than several hot laps later revealed some of the models bad points. The first was its tendency to wheel stand under full throttle. This could be tempered by steady throttle opening. The next was its tendency to roll over on corner entry if it was too fast and to skip from the slot if it was opened up in the corner. Mmmmm? I was prepared to drive the model steadily and accept whatever place I got so I placed the model back in the race box and carried on testing other models for other classes. The gaps between the contrate and the side flange. The class eventually came round and I placed the model on the grid ready for the off. The lights went green and the race was on. I was doing fairly well and settled into a routine when on gunning it on the back straight, there was the distinctive sound of stripped contrates. Another model was placed on my lane and the heat was run, I then took a close look at what had happened. 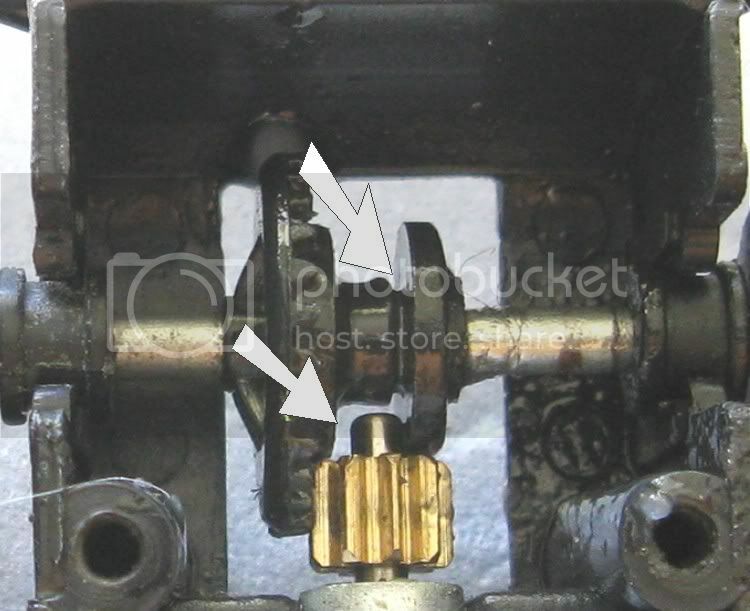 Surprisingly, the fault appeared to be that the slot in the contrate which the end of the motor shaft sits in was far too wide? I decided to leave further investigations for the workbench and the model was replaced in its box and tucked up cosy for the rest of the evening. A few days later it was top of the queue on the repairs bench. I decided to give it an inspection and to do all and any repairs and adjustments I thought necessary. 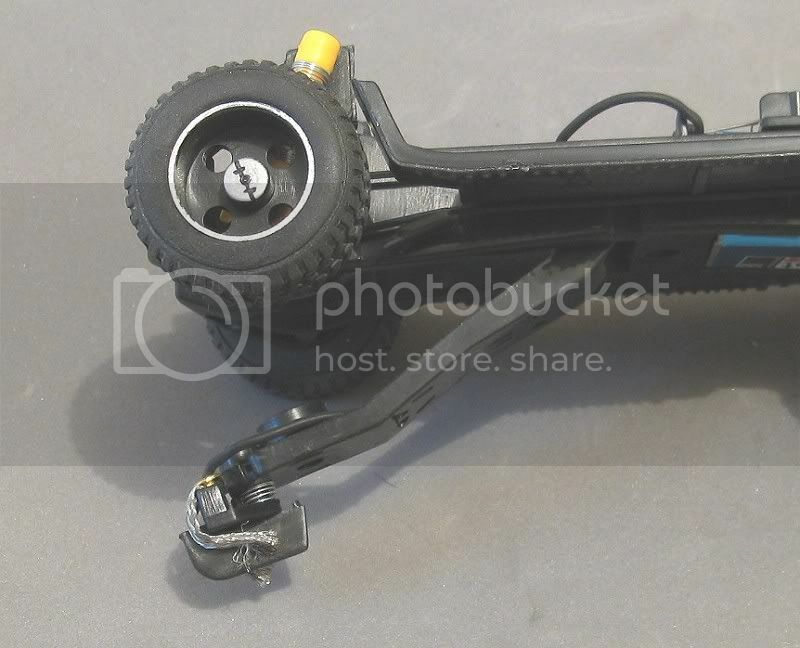 Another problem was that the front axle didn’t move on its suspension and the front axle was binding, causing the bands to be incapable of transmitting any power to the front wheels. Taking the body off I removed the rear axle and looked at it closely. The problem there was immediately obvious. The contrate on this model is made in two parts. The contrate itself, and the flange on the opposite end of the gear. What had happened on the track was that the flange had moved on the axle, allowing the pinion to move out of mesh with the crowngear. Rather than mess with the setup I checked through the spares box and found a spare new Scalextric contrate. After carefully stripping the axle, the contrate was replaced and the axle reassembled. I decided now to also look at the problem with the front axle. This was fairly obvious too. The pulleys for the drive belts were just a little too close together. This was causing them to bind against the front axle bearings and cause them in turn to bind in their slots in the chassis, stopping them from moving up and down. 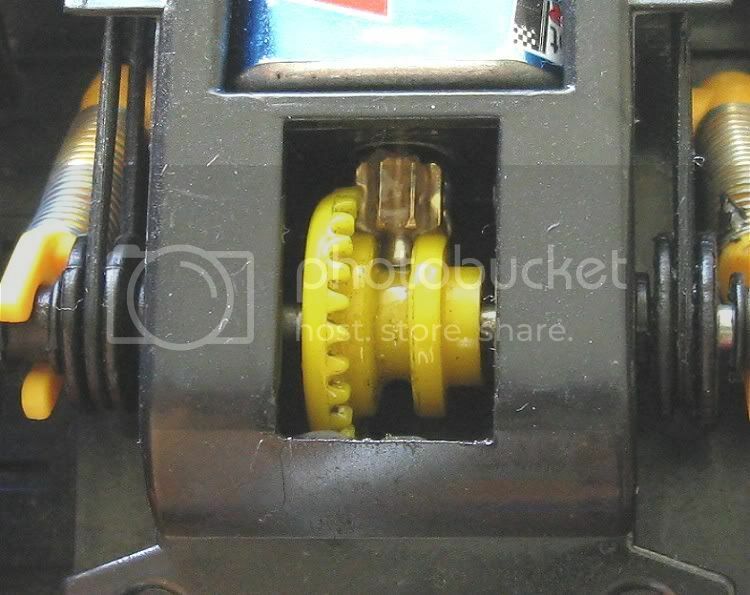 I carefully spread the pulleys by less than a millimetre and reassembled the front end. Problem fixed. The axle moved freely and the suspension was working well. The models tendency to tip over if pushed too hard is one of sheer mass. 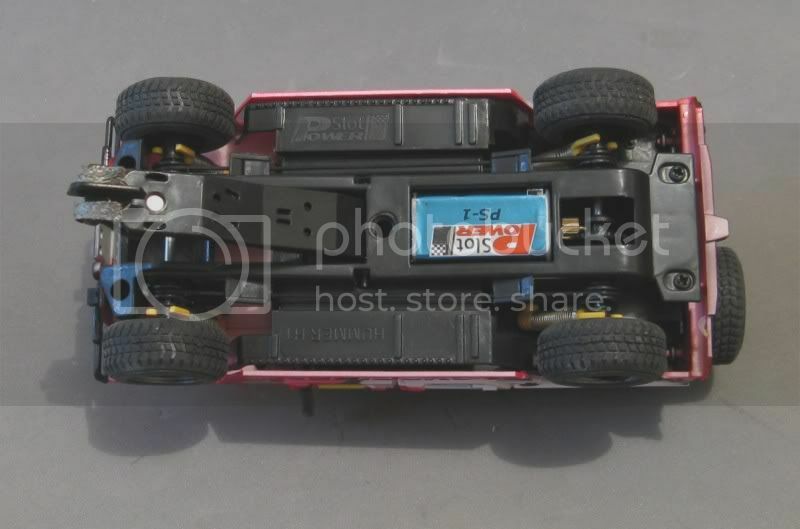 The model is a huge lump and the tyres are super soft giving it immense grip on a board track. The fact that the drop down guide has quite a strong spring in it complicates things too. This tends to create a bit of a ‘jacking’ effect to the front of the model and seems to add to the tipping moment once a model starts to tip. Before the next event I will have a go at reducing the spring pressure and see how it goes then. So, all it needs now is another Raid event to give it another work out. But no doubt that is a good few months away. Picked one of these up after seeing Phil's. They are a massive car - as big as a Fly truck with a good detail and they go pretty well. Look awesome racing along next to the Powerslot Quad bikes I also bought. I need to work out a replacement guide as I think the one that comes with it is too small.